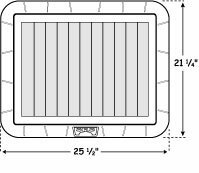 PRODUCT: SRFT1250FT, SELF CONTAINED 1050 CFM, FLAT BASE SELF FLASHING DESIGN, 15 Watt, SOLAR POWERED ATTIC VENTILATOR FAN KIT WITH FIXED THERMOSTAT. 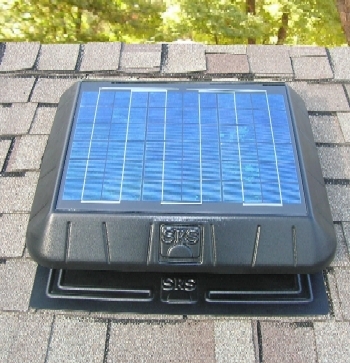 DESCRIPTION: The Solar Powered Attic Fan is constructed of components that include a 15 Watt photovoltaic module, Heavy duty shroud cover, D.C. fan motor / blade assembly with support brackets, flashing/base and stainless steel wire mesh screen. 1. Solar Panel: The latest state-of-the-art circuitry captures sunlight even on overcast days. Totally weatherproof, panels are designed for optimum efficiency and are hail and extreme weather resistant. 2. Cover & Base: Molded with UV-stabilized ABS plastic to prevent damage from sunlight. The top has a shingled appearance that helps the unit blend in with the roof while also providing additional stability and strength. 3. Fan Blade: Specially designed 5-blade, 12" aluminum fan is pitched for maximum air flow. It operates whisper quiet with no harmonic noise. 4. Stainless Steel Screen: Keeps animals out while allowing maximum air flow. 5. Mounting Hardware: Stainless steel motor brackets and vertical standoffs provide a flexible and adjustable frame for easy removal or replacement. General Specifications for Models "SunRise 850, 1050, and 1250"
Motor: 1–38volt DC with external brushes. Fan Blade: 12” diameter, 5-blade aluminum with balanced hub. Hardware: Stainless steel motor brackets, fasteners, and screen. Aluminum rivets. Thermostat: Pre-wired, pre-set thermostat will come on at 80 degrees F. and turn itself off at 65F. Top and Base: UV-Stabilized ABS plastic with acrylic cap (paintable). Base: Curb Base Style: 20.25" x 20.25"
WARRANTY: Manufacturer provides 10 years on the housing, 10 years on all parts except the motor which is 5 years (replaceable item). A mail in warranty registration card is included with each unit.